I have to hand it to Apple. They’ve basically taken a serious foothold in the market based almost entirely on the success of their iPods, which has since branched out into suave laptops (like the one I’m writing on) and high-tech gadgets like the iPad and iPhone. All of this despite the fact if you look at the nuts and bolts of their hardware, your standard Macbook isn’t all that super. That being said, one area I definitely give Apple kudos in is the aforementioned iPod division. They continually come out with new innovations while also making their products more affordable. 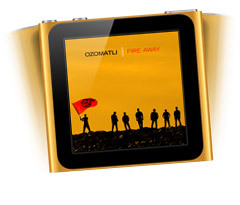 The latest product I have my eye on (in a gift-giving sense) is the latest generation of the iPod Nano. Priced at just $149 (or spend an extra $30 for double the hard drive space) for 8 GB of tuneage, the new nano is a cute little square, about the size of a matchbook or pocket square. In fact, the latest generation of the Nano resembles the uber cheap Shuffle with its clip-on, ultra lightweight design and sparkling rainbow of coloured aluminum casings. You can also tune into the radio and take advantage of very future-tech features, like giving the actual Nano a shake to have it switch into random mode. Unlike the Shuffle, you can also see the album covers and use your fingers to navigate through your albums, just like a full-size iPod Touch. Plus, 24 hours of sweet battery life…bliss! To sweeten the deal, Apple is also offering free engraving (with no extra time added either) when you order from their online store directly. As much as I might be coveting a Nano for myself, I’m moreso thinking about getting one for my pa, who has long since been pining for an iPod to ‘play his favourite songs’ (this coming from a guy who has thousands of CDs in his catalogue…good luck whittling the list down!). The price is quite right to go halfers for a Christmas gift (if I’m feeling generous anyway), and it has all the features he wants – album covers, touch screen, and not an overwhelmingly large data drive. Perfecto! Of course, the iPod may not be an ideal gift for your mom or dad – depending on their tech-savviness. That being said, there are many a teenager, young adult, or adult in your life that would love this super sleek gizmo with a price tag that won’t make your eyes bulge with sticker shot. Again I say, perfecto!